Two popular Hanoi shopping areas are Hang Gai Street and Hang Bong Street, known for tailored garments, embroidered tablecloths, traditional hand-painted silk greeting cards, water puppets and antiques at a steal. Dong Xuan, Hanoi’s largest covered market, stocks three stories of t-shirts, trinkets and bags with Vietnamese snacks and desserts sold at its hawker stalls. For shopping in Saigon, head down to Ben Thanh Market on Le Loi Street, the biggest and oldest market in Ho Chi Minh City with over 3000 stalls. Vietnamese arts and crafts on Dong Khoi Street are sold alongside a good mix of local boutiques and international brands which are also available at Windsor Plaza. A popular Vietnamese natural attraction is Son Doong (Mountain River) Cave, claimed to be the world’s largest cave. Phong Nha-Ke Bang National Park’s mountains are perfect for climbing and exploration, containing Vietnamese archaeological and historical relics. Halong Bay, the imperial city of Hué, the ancient quarter of Hoi An and the My Son Sanctuary, the TrangAn landscape complex, central sector of Imperial Citadel of Thang Long in Ha Noi and citadel of the Ho Dynasty are other UNESCO-recognised sites. Ha Long Bay, another UNESCO site, is the top tourist attraction in north Vietnam, Each of its thousands of islands along a 120 kilometer coastline is topped with thick jungle vegetation, resulting in a spectacular seascape of limestone pillars. Some of Halong Bay’s islands support floating villages, while others are hollow caves you can explore. Hoi An is an idyllic fishing village that’s also known as the “Venice of Vietnam” because of the narrow canals that cut through it. 40 kilometres from Ho Chi Minh City, Cu Chi Tunnels tours offer a history lesson about the Vietnam War. Visitors can crawl around in the safer parts of this immense network of connecting underground tunnels, which was used by Viet Cong guerillas and served as a base of operations for the Tết Offensive in 1968. Sa Pa’s rice terraces offer a glimpse into the lives of the local mountain people. The Hmong, Giay, Dao, Tay and Giay grow rice, corn and vegetables the Muong Hoa Valley in this northwestern town. Beach lovers can visit Vietnam’s Phu Quoc by the Cambodian coast, for its untouched coral reefs and sandy beaches. 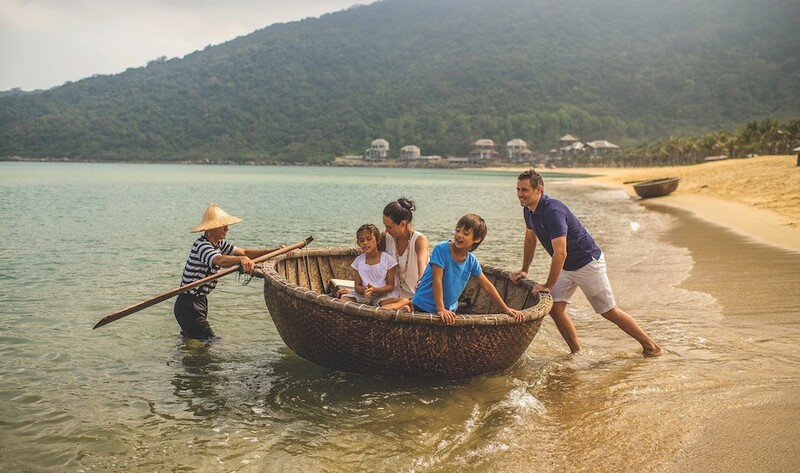 Nha Trang, the scuba diving centre of Vietnam, is a seemingly endless stretch of sugary sands and azure waters, making it Vietnam’s most popular seaside resort town. There are a multitude of Vietnam dive sites along its eastern coastline. From gentle sloping coral reefs rich in biodiversity to vertical dropoffs 50 metres deep, the coastal waters off Vietnam are great for diving trips. Nha Trang is the starting point for many snorkel and dive sites in Vietnam’s side of the South China Sea. Expect a more temperate climate there. Southern Vietnam‘s tropical climate offers slightly warmer water temperatures with the Con Dao Islands and Phu Quoc Island as up and coming snorkeling destinations. Con Dao, a group of islands and islets off Vietnam’s southeastern coast protected by Con Dao National Park, is the only snorkeling location where you can dive Vietnam’s waters with rays, turtles and dugongs, also called sea cows. Rare species of colourful coral and fish such as frogfish, paperfish and cowfish will also make your Con Dao dive trip worthwhile.